Although the present Golf Club dates from 1931 the origins of the Club can be traced back to the last century when Major Harold St Maur of Stover House (now Stover School) created a golf course on his own estate in 1894. This course was originally private for the pleasure of the Major and his friends. 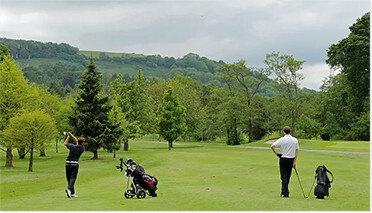 However such was the interest in the game that after three years the course was opened to the public and eventually became known as “The Stover and Mid-Devon Golf Club”. Records indicate that it was a 9- hole course situated on both sides of the Newton Abbot / Bovey Tracey road. The club was founded in 1899 and as the course formed part of the Stover Estate it was of necessity interwoven with the Stover pheasant shoot. The original Head Gamekeepers cottage eventually became the Club Steward’s residence and the pheasant rearing shed is still in existence today, now used as a trolley store. The first recorded entry in the Minutes of the Devon County Golf Union in 1912 indicated that the Club was represented by a Colonel Goad. Whilst there is little documented history for the period from 1900 to the outbreak of the First World War an extract from the Ladies Golf Union Handbook of 1914 indicates that it was then an 18-hole course of 4,988 yards. Golf continued on this course until the Great War 1914-18, the outbreak of which heralded the demise of the Stover and Mid-Devon Golf Club when the ground was given up to agricultural purposes and the important task of producing food for the nation. In 1923 an attempt was made to create another course on land on the south side of the town. Although this reached an advanced state, nothing happened after a May announcement in the Devon and Exeter Gazette and that the scheme was not to proceed. Eight years later on 5th March 1931, a meeting was held by a syndicate of local businessmen to set up the new club, James Braid having already visited and planned the course. With J.R. Stutt as his ever faithful constructor, nine holes were open for play by 1st May and the rest by the end of the year. The course measured just over 6,400 yard and remained intact until WW2 arrived and in 1942 a compulsory purchase for the north half of the course, holes 1-8 was issued for an American hospital. 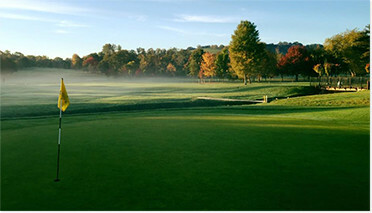 The nine hole course gained two new fields in 1945, fourteen holes were in play by 1947 and more meant the completion of all eighteen by 1949. Ironically, the club was asked in 1948 whether it wished to have its original land returned, or £4,000. It took the later. A Polish Resettlement Camp was then established. Of Braid’s course four holes remain. The present course is shorter and tighter than Braid’s original course.